Last week, MSC Cruises had a £1 sale - for one week only the first passenger paid the regular fare and the second paid £1 - €1.20 or $1.50 for a week away. And at the top end, Seabourn is offering a one-week 60% off sale. What better time to relax, forget the downturn for a bit, and go on a cruise? 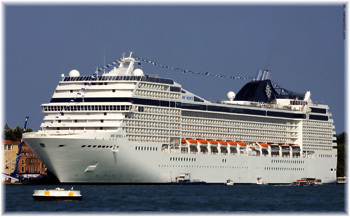 Yesterday, MSC Cruises in the UK ended its one-week only £1 fare promotion. On more than 100 departures between March and November the line offered a £1 fare for the second passenger when the first paid the brochure fare. MSC offered this deal for one week only, from December 1 through 7, but it will be interesting to see if it was successful enough that they might come back to the trough again. It is certainly a way of attracting attention, but basically it is the equivalent of a "two for one" sale, although on many departures. Because of a power outage at MSC's London office this weekend, The Cruise Examiner has just learned that this offer has been extended by one more day - until 18:30 London time today, so act now if you're interested in this one! In today's climate, the cruise lines claim to be doing alright for 2008, where their business has been booked for some time, but there is great uncertainty about 2009 as we head into the present downturn. So where are the deals? Pretty well everywhere it seems, "two-for-one" offers are commonplace, even 60% off and two-thirds off in some cases. Azamara is charging less than $100 a night for an 18-day Southeast Asia cruise this month and less than $80 a night for a March Transatlantic cruise. 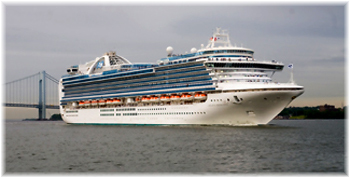 Transatlantic trips have become very popular with Oceania, who operate very similar ships. 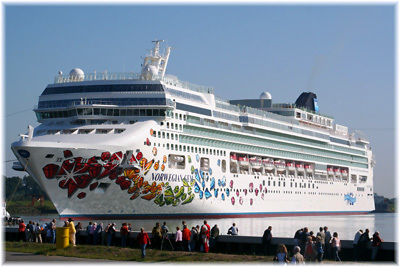 Carnival has a 3-night Bahamas cruises for $99, 5-night cruises from $199 and 7 nights from $279, truly bargain fares. 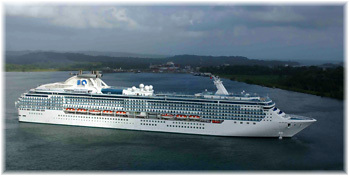 Celebrity will do 10 nights from $599 in the southern Caribbean. Costa Cruises is doing Med fly/cruises from the UK for £529. Upmarket Crystal Cruises is now bookable from $2,670 for a week. Holland America offers 16 nights in South America for $949. MSC Cruises, in addition to it's £1 cruise offer in the Uk, is offering a 60% off "Baby Boomers and Seniors" sale in America. NCL is offering 5 nights from $279, 7 nights along the Mexican Riviera from $349 or 14 nights in the Caribbean for $499 in October, and $469 for 9 nights in the Med in January (year-round Med cruising has been with us for a few years now). 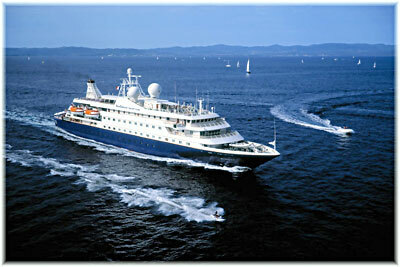 And that Oceania 14-night Transatlantic cruise in March is being offered for less than $80 a day, the same as Azamara. For last-minute bookers, Fred Olsen Cruises is offering a 7-night Christmas markets cruise this Saturday, December 13, for £345. Princess Cruises will do a week for $499, as is Royal Caribbean, who are also offering to book a 3-night Bahamas cruise from $159 or 10 nights to the Canaries for $729. In the UK, one internet agent is doing 50% off on selected sailings by P&O Cruises, but only until December 10. Even Seabourn is offering 60% reductions on some sailings for a limited period. All the above fares are per person in double occupancy and it pays always to check the extras, including port charges, government fees and gratuities when making comparisons. These are also entry-level fares, usuallyfor the cheapest inside cabins so check with your agent for outside and balcony stateroom fares. In the UK, Cunard is now offering 6-day Transatlantic sailings on the Queen Mary 2 between Southampton and New York, including a one-way flight home, originally from £999, from £699. This is cheaper than travelling on a cargo ship and applies for crossings made in April, October and November, 2009. Bookings must be made by February 28. In the United States, March and April sailings can be booked from $808. During the Great Depression some cruise lines arranged a payment plan to make paying for a cruise easier. Now, Hurtigruten in the United States have implemented a monthly payment plan for the same reason. With no interest charged and no credit check, intending cruisers can put down a $99 deposit and make refundable payments up to 70 days before sailing, with final balance due on 45 days. Applicable for departures between May and December 2009, Hurtigruten call this their Layaway Getaway program. It may take the minds of customers off how to pay,one wonders if it may give Hurtigruten a little extra cash flow as well. In addition, Hurtigruten is offering some two-for-one specials on certain departures in January-February and September through December. And for singles, it has a "Single Cabins at no extra charge" offer on selected departures. With the price of oil coming down to $40 a barrel from it's high of $ a barrel, most cruise lines have now withdrawn the fuel supplements that have been implemented over the past few months, which is also bringing down the cost of cruising. Some lines, however, are refunding supplements already paid as shipboard credits, which at least means that money will be spent with them, and others only apply for 2009 sailings. Remember the shoulder seasons usually offer the best deals - usually around March/May and October/November, as well as early December and early January, just before and after Christmas. If you want to book in high season, book as early as possible to get the best early booking reduction. Some lines also offer a full payment reduction, and while this may only be 2%, remember that interest rates may go to zero. 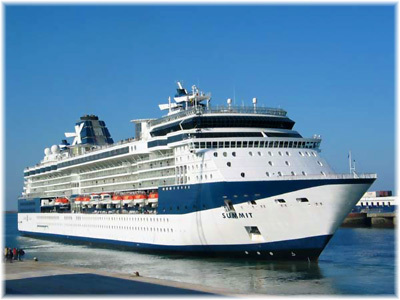 Winter Mediterranean cruises are often a bargain as these operators try to keep their ships going year-round, as are Transatlantic positioning cruises - spring over to Europe and autumn back to the Caribbean or South America. If you have lots of airline miles look at using them now to book your own flights. In fact if you have enough points in some programs you can book the whole cruise. And remember to use those points before they expire. The main thing is that in these times, cruising offers a super value holiday. All accommodation and meals are included and you can drink cheaply by buying drinks packages on the lines that offer them. You don't have to dine in the alternatives restaurants, not buy art at auctions, not for now pay extra to get into bars, and all the entertainment is free. Compare that to any land package and you will see huge savings.